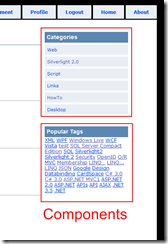 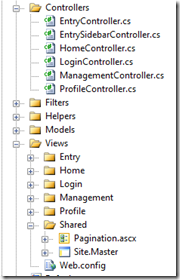 If you play with the MVC 2 bits for a while you will come to a very simple question: How can I display dynamic data on my master page? 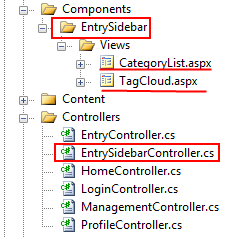 Each controller has it´s own View-Folder and render the specific view (EntryController route to Views\Entry\VIEW). 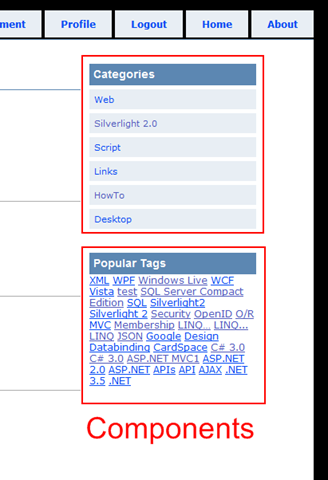 But if you try to add a dynamic control (a dynamic menu, news-ticker, overviews...) on a master page you have a problem: A master page has no real controller itself (maybe a master page could have a controller - but for this problem there is a very easy way to do this). 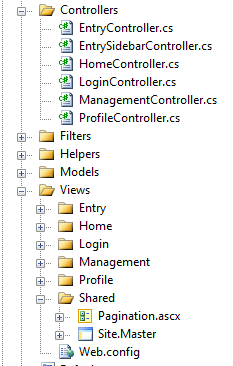 I use the "ComponentController" in my demo app to display the whole category list and the tagcloud. My "EntrySideBarController" inherit from "ComponentController"